That’s the case with the tabletop wrestling/hockey game shown above. That photo was tweeted yesterday by @NHLhistorygirl and brought to my attention by reader Marc-Louis Paprzyca. A quick search reveals that the photo comes from this eBay listing, which means this item can be yours for a mere $225.90. And what an item it is! First there’s the brilliantly absurd concept, which is one for the ages. Seriously, what combination of brainstorming, alcohol, gambling debts, alcohol, dares, threats, and alcohol led someone to declare, “I know — we’ll do a hockey game, but with professional wrestlers”? Then there’s the execution, which is loaded with great little details. I love that the box shows Hulk Hogan playing against a hockey-helmeted kid. I also love that Hogan is one of the players shown on the “ice” (and that he’s lifting weights with his hockey stick) — very meta! I also love that the players are packaged together in a way that essentially creates two teams: shirts (mostly) and skins (mostly). This isn’t the first time the game has gotten some renewed attention. Yahoo’s Greg Wyshynski, aka Puck Daddy, has written about it at least twice (look here and here), at one point calling it “pretty much the greatest table-top hockey game in the history of hockey and/or tables.” But it’s the first time the game has come across my radar (or at least I think so — maybe I’ve put it in the Ticker before and just don’t remember), and it’s totally pushing my buttons. Too bad they never convened a photo shoot with the real wrestlers wearing real skates on real ice. Is it too late for a reunion? Magnificent magnifier: There’s been a magnifying glass at the top of every Uni Watch page for many years, but there’s never been an actual Uni Watch magnifying glass — until now. 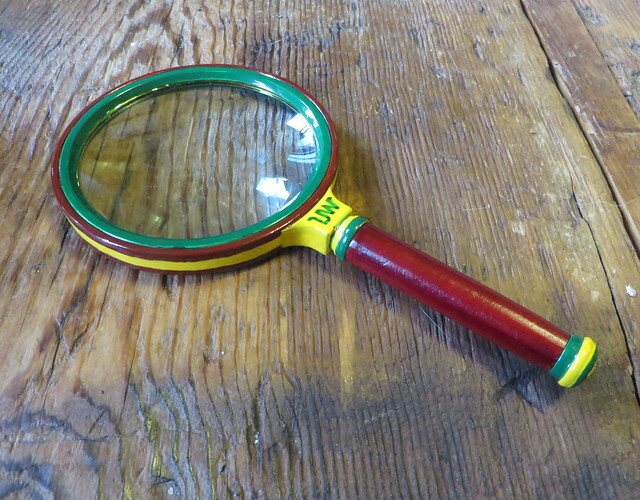 The one shown above was sent to me by longtime reader/pal Ben Traxel, who bought a conventional magnifier and hand-painted it. “I trust you will use it to solve vital uni mysteries for years to come,” he says. How nice is that?! Ben, you rock — thanks so much. ITEM! Your chance to get up really early in the morning just to watch me talk: On Tuesday morning I’ll be at a hotel in Madison, Wisconsin, participating in a panel discussion about uniforms that’s being organized by the local ESPN Radio affiliate. The bad news is that it’s not open to the public (the attendees will be representatives from some of the radio station’s advertisers, some local businesspeople, folks like that). The good news is that I’m raffling off a spot on the guest list. And the catch is that it begins at 7:30am (I think it will be over by 9:15-ish), so you’d have to be either nuts or an insomniac to want to show up that early. If that sounds like you, send an email to the raffle address by 7pm Eastern tomorrow. I’ll choose a random winner and let him or her know on Saturday. Grommets, continued: Totally hooked on this project now. The possibilities seem limitless. When I have more time I’ll create a Tumblr site for these photos (ditto for the key ring stories, which I haven’t forgotten about — just been busy), but for now I’ll post them here on Uni Watch. Baseball News: Oooh, really like this 1964 Cardinals beer glass. ”¦ You can get a better look at the sublimated snakeskin on the D-backs’ new caps here and here. ”¦ Speaking of new MLB headwear, it’s nice to see that the Padres’ brown cap will have the old-school eight-panel construction, instead of the standard six. Also interesting to see it won’t have the All-Star Game logo like the team’s regular caps will have. NFL News: Giants WR Odell Beckham Jr. is pushing back against the notion that his gloves give him an unfair advantage. And he’s right: His gloves are no better or worse than anyone else’s, and what sets him apart is clearly his talent and athleticism, not his gloves. Or to put it another way, the gloves are a tool, and his natural gifts let him take full advantage of that tool, probably to a greater extent than most if not all other receivers. But it’s also true that neither he nor anyone else could make those one-handed highlight-reel catches bare-handed, and it’s silly of him to suggest otherwise. If everyone played bare-handed, Beckham might still be among the best in the game, but his catches (and everyone else’s) would be more conventional. That’s not an argument for or against gloves; it’s simply a measure of the extent to which they’ve transformed the game. College Football News: Here are the jersey patches for the Camping Supplies Bowl, the Car Insurance Bowl, the Chain Motel Bowl, and the Hawaii Bowl (from Andrew Cosentino, Chris Buttgen, Joe Farris, and Andrew Enright, respectively). ”¦ The coach of the year award’s corporate sponsor and the recipient’s school have the same colors (thanks, Mike). ”¦ Navy has been breaking in the new helmets for the game against Army. ”¦ A UNLV recruit was shown a new helmet design last weekend (from John Nissan). Hockey News: The Miami Herald is reporting that the Fla. Panthers will be getting a makeover for 2016-17. That will be the NHL’s final season with Reebok, so I think it’s fair to infer that the league won’t be undergoing any major changes when Adidas takes over in 2017-18. If a major template change or something like that was in the works, the Panthers would presumably have waited one more year. ”¦ Ace DIYer/genius Wafflebored’s latest project is a goalie equipment necktie. Great stuff, as usual. ”¦ Star Wars jerseys for the Syracuse Silver Stars (thanks, Phil). ”¦ Ugly sweater jerseys for Wisconsin-Superior (from Thomas Lidholm). ”¦ The Penguins added “9” helmet decals yesterday for Pascal Dupuis, whose career has been ended by a medical condition (from Jerry Wolper). ”¦ “The Avs did a great job Monday with their 20th-anniversary team ceremony, except that they had all former players to wear Reebok Edge jerseys, regardless if they actually wore them during their playing career,” says Evan Hassinger. “It really bothered me to see the likes of Ray Bourque, Rob Blake, Patrick Roy, et al. in uniprons. Back in 2010 they had a Stanley Cup reunion, and look at how good they looked in the original style jerseys.” ”¦ We’ve known for a long time that the Caps had a new red throwback alternate this season, but here’s our first look at the full uniform (from Mike Engle). NBA News: Looks like maybe Lebron James had roomier sleeves the other night, for obvious reasons. ”¦ Color vs. color last night in Milwaukee, as the Bucks wore their black alts against the red-clad Clippers. College and High School Hoops News: A little birdie tells me that the floor design at TCU’s revamped arena, which is due to open later this month, will have “a unique reptile pattern.” Between this and the Diamondbacks’ snakeskin uniforms, the reptiles are taking over. ”¦ St. John’s had a red-out last night, so they wore red at home against Niagara, which wore white on the road (from Kenny Kaplan). ”¦ Chicago Orr High School in Illinois has some seriously weird uniforms (from Erik Spoonmore). Grab Bag: New helmet design for Dale Earnhardt Jr. (from @GKG_77). ”¦ There’s a new initiative in Boise to preserve the city’s classic neon signs (from long-lost Vince Grzegorek). ”¦ Some new arena football league that will probably be defunct by the time you read this has a new team in Spokane (from Brett Gleason). 87 comments to Shouldn’t They All Be Hitting Each Other With Their Sticks or Something Like That? Unfortunately, a true reunion of the WWF’s two hockey teams would be difficult. Of the wrestlers on the box, Mr. Perfect, Big Bossman, “Macho Man” Randy Savage, Ultimate Warrior, and Earthquake are dead. Tugboat, however, would go on to be part of one of the most infamous moments in wrestling history, the “Shockmaster Incident.” If you’re not familiar with it, search for the video on YouTube (it’s totally SFW). Rick “The Model” Martel is dead too. I think that’s him in the pink sweater. my bad. I read the Google search wrong and thought he died in 95, but that’s just when he stopped being The Model. Dammit Toddro, get it together. Indeed it is; it being pro wrestling, some of these guys are dead. Did you put the grommets in the bread before or after toasting? I totally had this game when I was little. My grandma bought it for my brother and I for Christmas one year, which was a much bigger gift than any of my cousins received. I guess we were the favorites. We were constantly changing the teams of the wrestlers, taking them off their pegs and putting them elsewhere. I don’t know how many times I’ve thought that I wish I still had that game. In the commercial, those rods that the player slides back and forth to move the players look very thin, like they would bend easily. Do you recall if that was an issue? I had (still have) a 1970 Munro Bobby Hull table hockey game and the rods were quite sturdy yet I still managed to lean on one so that when you extend it fully, it’s leaning downward a bit instead of straight out. P.S. yeah Paul, that game is about the most awesome thing I’ve ever seen related to wrestling. How did I never hear about this when it came out? Going off some wayback memory here, but I do think the rods had a decent amount of give to them. Which I remember more from pulling the wrestlers off their pegs than actually playing the game. It would probably be pretty hard for me to say how much of the angle of the players had to do with bent rods and how much was our grade school handiwork. The tall one wants white bread, toasted, dry, with a grommet in it. Elwood wouldn’t want a grommet in his bread. Mrs. Murphy wouldn’t give him one, either. When you can grommet my scrambled eggs, give a call! A grommet omelet (sounds like a name for a band), maybe. I don’t see it working on scrambled. In an odd move, the WWF put only one Canadian on the box, the pink-scarfed Rick “The Model” Martel of Quebec City. Harts? Mounties/Quebecers? Dino Bravo? Missed opportunity. Interesting thing about the Avalanche jerseys linked in the ticker is they are uniprons but they have the old Big Foot shoulder patch. So basically they were last years left overs. That’s funny. Also… is “chinamen” really a racial slur today? I don’t think I’ve ever heard it used anywhere outside of the old TV show Kung Fu, and even then I don’t remember it being always negative. Try it on your Asian friends. Let us know how that works out. Well… I was basically just saying that it’s an outdated term that people don’t use any more… but if we really want to go that route, I don’t have enough Asian friends to properly experiment on/with. I’d have to assume though, that people actually from China might find it less offensive than people from Korea or Japan. From what I remember of the TV show, the character was from China, so people called him a Chinaman. It didn’t seem like it was automatically racist. Calling every Hispanic person you meet a Mexican is likely to have a negative result, but it doesn’t mean that Mexican is a racial slur. Basing an argument about racial politics — and your behavior regarding same — on a decades-old television show is certainly an interesting approach. You are clearly a master of race relations. Keep it up. I am disappointed in all of you in not referencing The Big Lebowski in this discussion. Maybe they were just out of their element. Exactly. The movie was made in 1998, and set in 1990/91, and that joke only works because audiences would know that “Chinaman” would have seemed laughably outdated and insulting to people living in 1990. That’s a quarter-century ago; ignorance as to whether “Chinaman” is insulting today is beyond mind-boggling. Some things, you just know on account of being a minimally attentive-to-the-world adult. if it had been a Native American who peed on the Dude’s rug and he referred to him as a “redskin” we wouldn’t even be discussing the Washington team name anymore. John Goodman and the Coen brothers could have saved us a lot of headaches. You can guess a person’s age by hearing which once-common/now-reviled figures of speech they seem comfortable using. Descending the slippery slope is a popular misadventure when we negotiate the ski resort of peripheral groups. I’m kind of perturbed that this Twitter bot thinks “Jews” is a slur. The guy uses other slurs for Jews. Is “Italian” a slur for people from Italy? Why does he think just practicing Judiasm and called a Jew is any different practicing Catholicism and being called a Christian? He also takes it very easy on African-Americans. There are plenty of slurs he could use without going all the way to n—-. So, it looks like he’s sensitive to African-Americans, but not Hispanics, Mexicans, Asian. Even in pointing out one bias, you reveal others. I was SO expecting a Budweiser logo on the Cardinals beer glass. At least “Bud” is not owned by the Belgian / Brazilian conglomerate AB InBev. Not that foreign owned companies are a bad thing at all, just kind of sad to see how the Bush family over time lost their grip on their own company by the lubricious application of money. On the plus side, you have real “Bud” in Colorado. 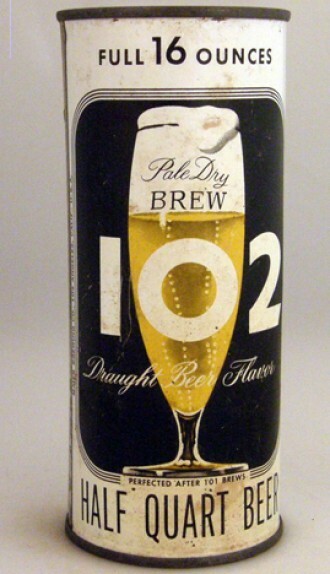 This could all be alot worse… I can remember in the late 70’s driving home from work and seeing the great Brew 102 neon sign, but do not be deceived, Brew 102 was without a doubt, one of the world’s worst beers. Even under-age blue balled teenagers would not drink it. 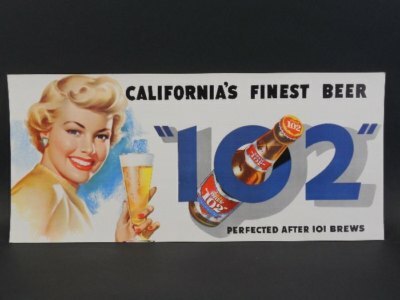 lastly an ad/propaganda billboard from the 50’s with a Doris Day clone promoting this Cali-canal water beverage. er… sorry about the dead link… here is a link that works, in theory. Here’s a bit on the controversial Miss Brew 102 contest. Love the tie in for the wrestling table hockey with Mean Gene Okerlund. Who’s son Todd Okerlund played on the 1988 US Men’s Olympic Hockey team. I like that the wrestlers sticks go along with their character. Sgt Slaughter has a missile, Jake the Snake’s stick is just an extension of the snake around his neck, Big Boss Man has nightstick, Ted Dibiasi’s stick is solid gold…Pure Genius! Came to say this. Not gonna lie, those sticks are clever. Also my only issue with the Caps new throwback/3rds is that the color pattern on the gloves is all out of whack. Cuffs and fingers should be red with the back of the hand blue. Other than that they look great. I actually kinda like the Dbacks caps up close, as far as faux-snakeskin baseball caps go. If they had to go with the gimmick, wish they had gone with the happy medium using those those caps with non-“snakeskin” jerseys, or maybe one jersey with the snakeskin pattern applied in a much less slapped-on-wherever-we-can-fit-it-on-its-own-fabric-panel sort of way. And I’d like the caps even better if the logos were outlined in teal. These latest pictures do make them look less bad to me than the unveiling photos. I think I might actually have liked the gimmick if they’d been textured somehow, applied on the surface of the cap, rather than printed in the fabric. Also, I picked up an orange Astros cap on closeout this week. First time I’ve seen the current Astros cap logo up close, and it’s really disappointing. New Era is making the white portion of the H the puffy raised bit, and the gray beveling on the H is flat embroidery. Makes it look like the elements of the H are misaligned rather than representing a beveled letter. The old Nats gold-beveled DC cap logo was much better executed. Puffy hat stitching is Satan’s volleyball. the Uni-Watch magnifying glass & the grommetted toast are both fantastic! The Miami Herald is reporting that the Fla. Panthers will be getting a makeover for 2016-17. Good. The sooner that goofy panther is shitcanned, the better. I hate those overdone cat insignias from the 90s, like the one gracing the Columbia U. football helmet. I’ve never been much of a fan of the leaping panther, either. It is somewhat amusing that this comes out just after Broward County commission voted in favor of giving the Panthers a subsidy. If that had failed, there would’ve been the chance the team would be getting new uniforms anyway, if they were to relocate after this season. However, the deal *should* put a halt to speculation about moving for a few years, at least. I hope it’s not a casualty of the refashioning. Maybe a giant grommet in the toast for a “toad in the hole” or “crow’s nest” type of breakfast. Or,…MMmmm…edible grommets. Hey, I though of it first! This is my documented proof! No stealing this idea! Regarding the Avs’ celebration, it’s pretty common for “all-time” teams or similar celebrations involving players from multiple eras to just use the team’s current jersey. I know, for example, that Barry Sanders has worn whatever Lions jersey was the current model when he’s appeared at Ford Field. The Lions’ 75th anniversary team did wear throwbacks, but they were the team’s third jerseys at the time. The Avalanche do need to fix their sweaters, though. Badly. Or replace “bird” with “grommet”….. 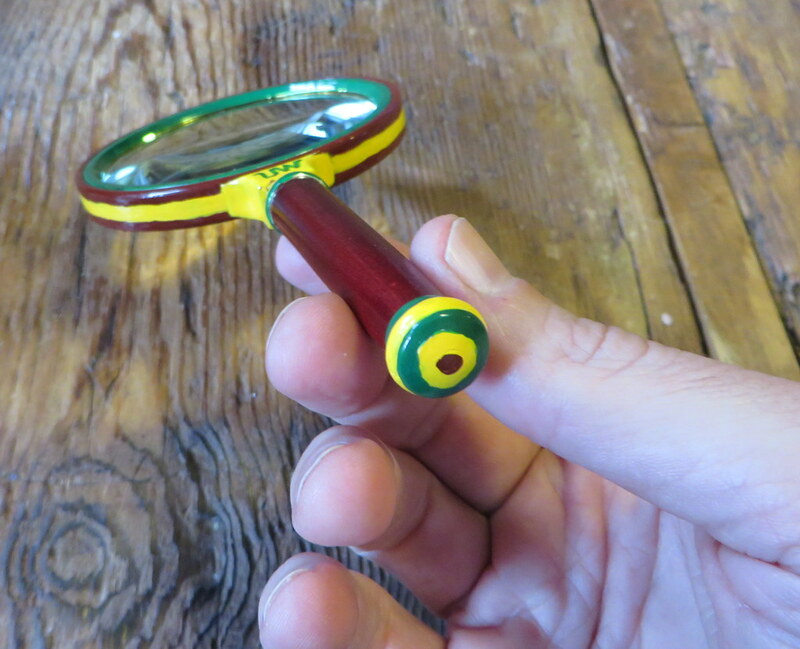 I hate to rain on the parade, but this being a place where accuracy and authenticity reigns supreme, I feel it necessary to point out that the magnifying glass is not accurate. It should have a green handle with a gold bezel and end cap. In fact there shouldn’t be any red in it at all. I’m being facetious as well. Ben wasn’t trying to replicate the mag glass at the top of the page; he was simply creating a Uni Watch mag glass. -The Syracuse Silver Stars are an indoor soccer team. How long has catch of the day been gone…? … And that’s why it’s gone. Any theories as to how that hockey wrestling game came to be? Did the manufacturer already make a hockey game and was either trying to recoup costs in the tooling etc., or just figured it would be an easy way to create a wrestling game? Magnifying glass project is cool. Don’t forget the Rams/Bucs Color Rush/Rash is supposed to debut tonight. I wouldn’t read too much into the Panthers getting new uniforms a year prior to a “major” league-wide change. The Buffalo Sabres changed to the slug uniforms the year before the Edge jersey takeover. Granted, it was the same manufacturer, but a lot of teams overhauled quite a bit. BLACKHAWKS used a table hockey concept as part of their game presentation back in 2010 which included Team Ambassadors Bobby Hull, Stan Mikita, Denis Savard and Tony Esposito. PS. Its’ the Syracuse Silver KNIGHTS (not stars). And they’re an indoor soccer team (the post is listed under the Hockey headline). There isn’t precedent for NHL teams wearing an “alternate” alternate set of breezers for a couple games, is there? As awful as white pants for the Caps would be as the “official” alt, I can’t help but wish they’d go white pants for a game or two. If they put on red breezers with the recent set of white star-spangled sweaters, you may assume a precedent has been set. The first-year Caps were acutely aware of the alternating strips of red and white as you measured the player from head to skates, a pattern that was upset when they resorted to the blue shorts. The WWF hockey thing is after my time. I’m more of the Superfly Jimmy Snuka, Chief Jay Strongbow, George “the Animal” Steele, Iron Sheik, etc. 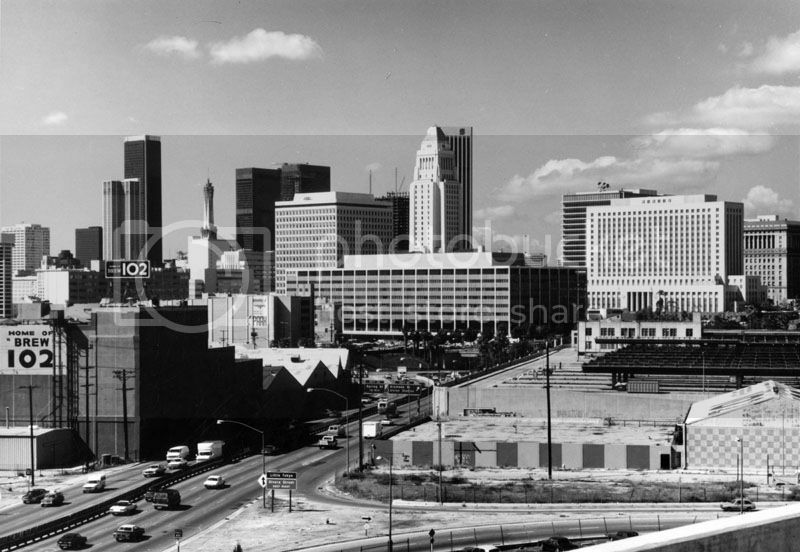 (and even before) era. Speaking of new MLB headwear, it’s nice to see that the Padres’ brown cap will have the old-school eight-panel construction, instead of the standard six. Strictly speaking, and I am unanimous in this, an eight-panel cap ought to have eight eyelets. The 4 forward-facing panels comprise two halves of the gold “spinnaker” shape, and the 2 brown fabric crescents completing the front third of the hat. To be sure, an 8-panel cap, but maybe not in the traditional sense. That was my expectation as well. I think the Padres’ caps are more of a split-6, with two of the panels cut in half. An 8-panel cap is more like this. Yeah baby…My alma mater Sam Houston State University is going with the Orange Hats, shirts and britches on Saturday vs. Colgate. Love the 1-AA playoffs!!!!! Is the S missing in San on the San Diego State jersey or is it weird fold? When I saw your “toast grommet,” I immediately thought of Wallace & Gromit, a very entertaining set of short films that revolved around a man named Wallace and his dog, Gromit. In one scene from ‘The Wrong Trousers,’ my favorite one, Gromit fixes Wallace some toast with one of his extremely elaborate devices, to which Wallace offers the following compliment (https://youtu.be/LLDXNPGUwSo). I immediately thought of this when I saw the “toast grommet” as a result. Fantastic set of cartoons, by the way. Entertaining for kids and adults. For me the use of the word grommet today for some reason brought to mind this old Bell Canada commercial. I love that WWF hockey game, had it as a kid way back when. 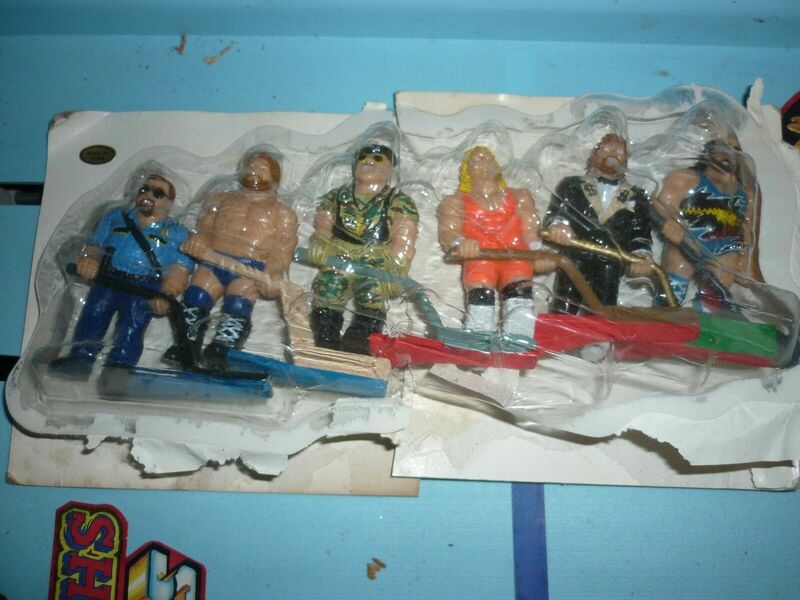 I wish I would hadmove held on to it to, the figurines (which as someone pointed out above al have very character specific sticks) got for a lot on the wrestling action figure market. The Spokane thing is neither a new league nor a new team. The Arena Football League’s Spokane Shock dropped down a level (at least) and wanted to take their identity with them, but they could not reach an acceptable deal with the league for the rights. So they had to change their name to Empire. Same team. Existing league. New identity. New entrant to the league. Didn’t think about it until I saw them side by side but the color rash unis for Tampa Bay and St. Louis remind me a lot of ketchup and mustard when they are together. Watching TNF, I noticed that Larry Fitzgerald had miscolored socks (which no other Cardinal had). Random question…how are the home and away teams decided in bowl games? Highest ranking is the ‘home’ team? Alternates from one conference to the other each year?